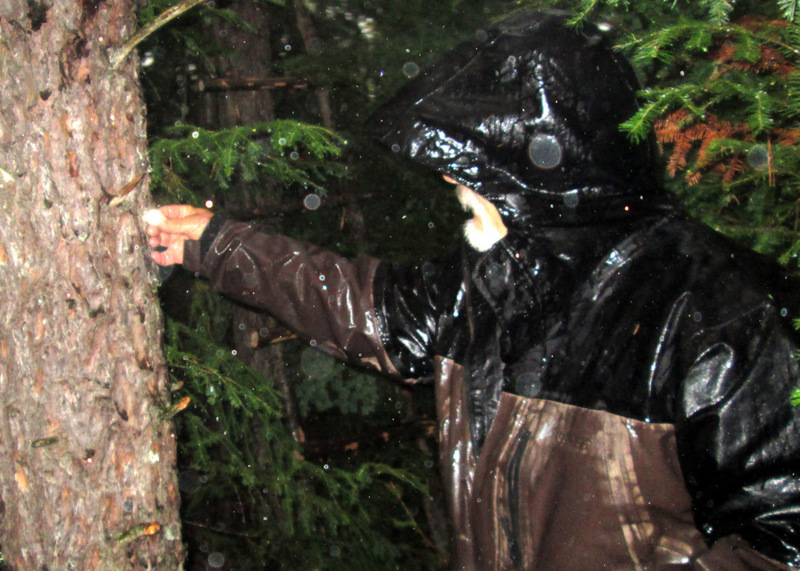 Doc placing a flourescent tack on a tree. Though I’ve always had an uncanny ability (according to others) to get to where I wanted to go in roadless wilderness areas, even teaching many boy scouts to do the same, I’ve known many others who seemed hopeless when it came to forest navigation. One of the worst I this regard was my lovely, headstrong wife who invariably insisted on turning to the right when left was right or vice versa. I never dared leave her alone in the woods more than a few minutes while we were photographing or studying whitetails. No one is a born woodsman. The knowledge and skills needed to unerringly hike far from one place to another in the woods in arkness or light must somehow be learned. As each of my five children became old enough to accompany me while hunting ruffed grouse and scouting for deer, I warned them before stepping into the woods that they would be required to lead me back to the car. We began this training short distances from the car or camp and then gradually gave them the lead farther and farther away as they grew older. Unless in a hurry, I’d usually allow them to make mistakes along the way and then direct them to figure out what to do when they finally realized they had made a mistake. 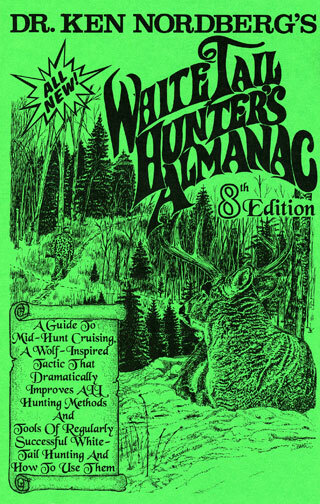 I taught them to make a habit of looking for land marks and remembering, certain big trees with unique features, for example, not only to make it easier to maintain a straight course in whatever compass direction was appropriate at the time, but to provide an easy means to get back on course after making a necessary detour around water, mud or difficult terrain. I taught them to remember landmarks by giving them names. 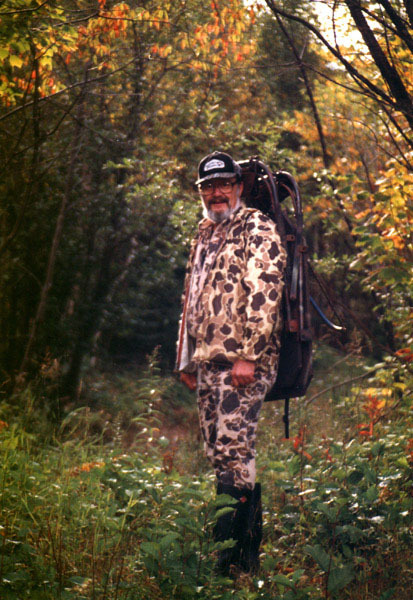 Today, our deer hunting area is full of named landmarks such as Bunyan’s Marble, City of Rocks, Tumbling Brook, The Creek Crossing, Antler Mountain, Lots of Bucks Mountain, Acorn Mountain, Birch Mountain, Moose Mountain and Totem Pole Trail. I even taught them to recognize silhouettes of certain trees when seen against a starry or moonlit sky — starting points for trails well away from roads. After determining which compass direction to follow, I taught them to keep a breeze blowing on one part of their face as they proceeded. I taught them to use positions of shadows to keep to certain compass directions as well, periodically making necessary adjustments as the sun slowly moves across the sky. I taught them to clean important trails, the finished products appearing to be no more than an ordinary deer trails. I taught them to mark trails in ways unlikely to be noticed by others, using fluorescent tacks, rocks and dead branches or logs. It was mandatory for them to accompany me while scouting before hunting seasons when they were taught to accurately assess deer signs and their relative values for deer hunting. 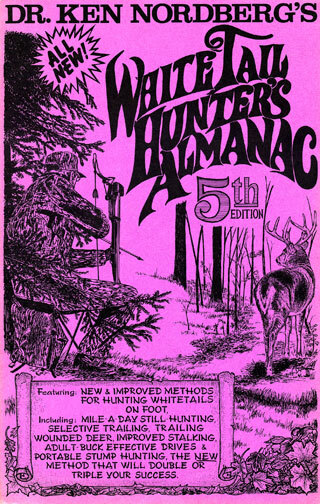 They were taught how to select productive stand sites and prepare them for hunting stand-smart bucks. I often stepped aside and invited them to lead the way wherever we went so they’d become familiar with the trails we used or planned to use. I taught them to use a watch to aid in navigation, explaining if you head west for an hour and then want to return, head east for an hour. I taught them to never head into the woods anywhere without frequently referring to a compass and having an “escape compass direction” to use as a backup: head south if you become lost in which direction you’ll eventually come to a certain road, for example. I taught them to make sure other hunters in our group knew exactly where they’d be located during each half-day of hunting. 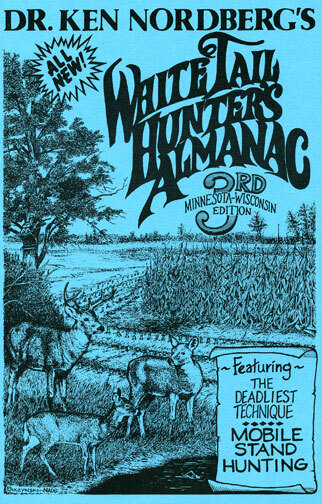 I never considered my children fully qualified to hike to stand sites alone or find their way back to camp alone until they had hunted deer for at least two years. A line of flourescent tacks along a trail. 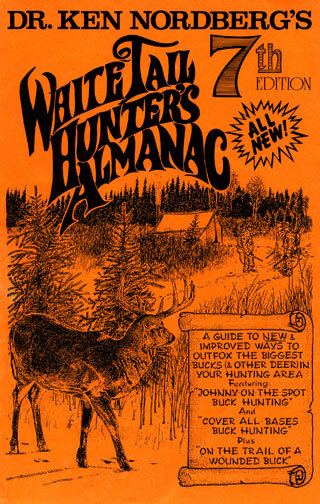 When children of their own began showing up in deer camp, their fathers and grandfather (me) used the same teaching methods to get them ready for forest navigation, including instructions for what to do if forced to spend a night in the woods. 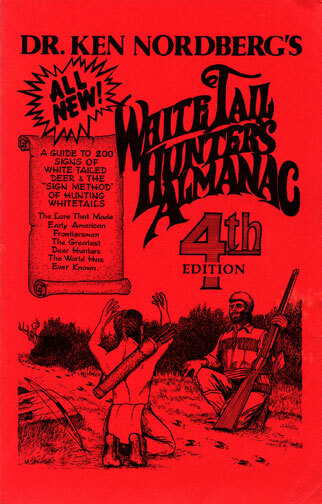 We taught them what to carry to insure survival if that became necessary (see Whitetail Hunters Almanac, 8th Edition). The common term used in our deer camp today to describe a youngster finally considered ready to properly hike to and from stand sites alone in darkness is, he or she is now “a real woodsman.” We insist our youngsters receive such training not only for their own safety and for our own peace of mind, but because faultless forest navigation in darkness is such an important part of how we hunt mature bucks. 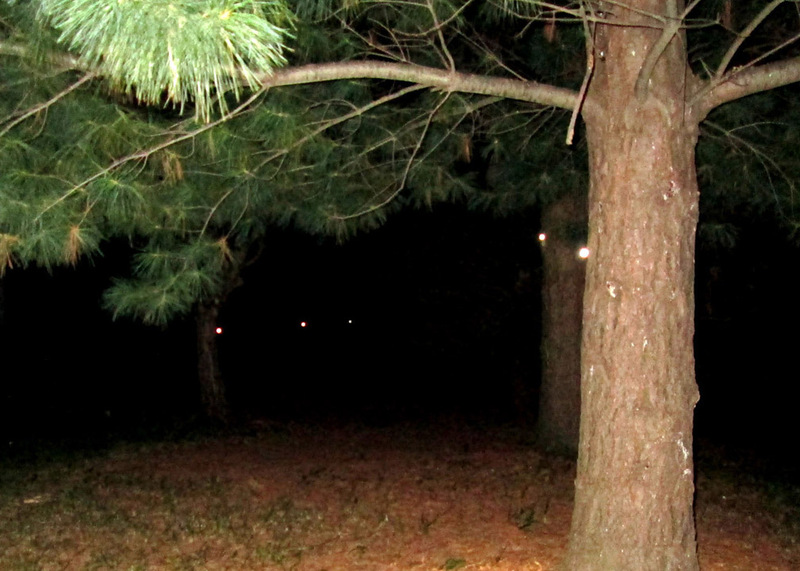 Few hunters have had the kind of training my children and grandchildren have had and I certainly can understand why so many other hunters fear becoming lost in the woods, day or night. 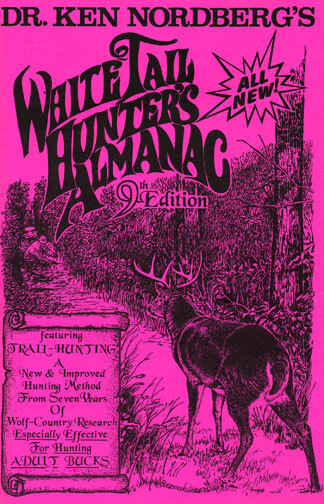 If you are such a hunter, begin your education to become “a real woodsman” by printing (or get someone else to do it) an enlarged up-to-date aerial photograph of your hunting area, available free on the internet from Google™ maps, Bing™ maps or Flash Earth™ maps, and study it over and over again. Learn what compass direction to take to get to a certain stream, opening or other feature of the land on your map. Purchase a GPS and learn to use it so you can determine exactly where you are, day or night, any time you are unsure of your location. Meanwhile, read the paragraphs above, over and over again, and begin teaching yourself by doing what I have done to teach my children and grandchildren. And be patient. Such an education cannot be completed in one or two weekends of scouting or hunting.